"What makes the modern university different from any other corporation?" asked Columbia's Andrew Delbanco recently in the New York Times. "There is more and more reason to think: less and less," he answered. 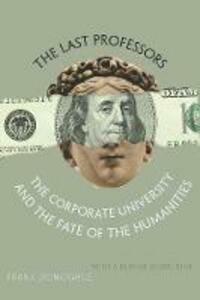 In this provocative book, Frank Donoghue shows how this growing corporate culture of higher education threatens its most fundamental values by erasing one of its defining features: the tenured professor. Taking a clear-eyed look at American higher education over the last twenty years, Donoghue outlines a web of forces-social, political, and institutional-dismantling the professoriate. Today, fewer than 30 percent of college and university teachers are tenured or on tenure tracks, and signs point to a future where professors will disappear. Why? What will universities look like without professors? Who will teach? Why should it matter? The fate of the professor, Donoghue shows, has always been tied to that of the liberal arts -with the humanities at its core. The rise to prominence of the American university has been defined by the strength of the humanities and by the central role of the autonomous, tenured professor who can be both scholar and teacher. Yet in today's market-driven, rank- and ratings-obsessed world of higher education, corporate logic prevails: faculties are to be managed for optimal efficiency, productivity, and competitive advantage; casual armies of adjuncts and graduate students now fill the demand for teachers. Bypassing the distractions of the culture wars and other "crises," Donoghue sheds light on the structural changes in higher education-the rise of community colleges and for-profit universities, the frenzied pursuit of prestige everywhere, the brutally competitive realities facing new Ph.D.s -that threaten the survival of professors as we've known them. There are no quick fixes in The Last Professors; rather, Donoghue offers his fellow teachers and scholars an essential field guide to making their way in a world that no longer has room for their dreams.